BYU research • Games can promote physical activity for children. 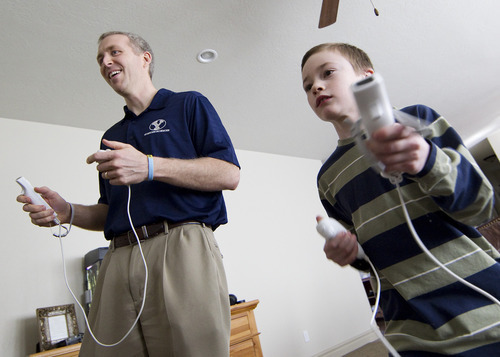 BYU exercise scientist Bruce Bailey plays the Wii with his son Dallin. Photo by Jaren Wilkey/Brigham Young University. In an XaviX video game called J-MAT, the player follows action-movie star Jackie Chan running and leaping through the streets of Hong Kong, imitating the moves on a footpad. Along the way, kids burn about six times more calories than if they were just staring at the screen. A new study led by Brigham Young University concludes that video "exergames" can get exercise-averse kids off the couch and moving. "These types of video games can increase physical activity to a moderate to vigorous level, assuming the appropriate games and levels are chosen," said Bruce Bailey, an assistant professor of exercise science at BYU and lead author of the study published online Monday. It may seem ironic that video games are being advanced as a way to address obesity among the nation's youth. Aren't video games, after all, a main culprit in the decline in physical activity? But the findings encouraged one leading advocate for restoring outdoor play in the lives of children. "Some video games are better than others," said author Richard Louv, whose book Last Child in the Woods coined the term "nature-deficit disorder" and sparked a national discussion a few years ago. "It's a positive thing that they found games that encourage kids to move. Obesity is a very complex issue. There isn't one magic bullet." The new study used 39 healthy boys and girls, ages 9 to 13, who participated in an after-school program in Boston. They were from diverse racial backgrounds, but most were African-American. Twice a week, researchers ran them through 90-minute sessions, rotating among six games. Three were commercial platforms  Light Space's Bug Invasion, Sportwall and Cyber Trazer's Goalie Wars  and three were consumer products  Nintendo Wii Boxing, XaviX J-MAT, and Dance Dance Revolution Thirteen. The children played each game for 10 to 15 minutes, with rests in between, while the researchers recorded their exertion, measured in energy expended per minute. Also measured were their enjoyment of each game and exertion while walking at 3 mph on a treadmill. Researchers set the games' intensity levels the same for all the kids. "All the games are different and have limitations about how active children can be with them," Bailey said. "Some require coordination. If you make it too intense, they get frustrated and stop playing." Louv faulted the study for comparing the games' caloric-burn rates with walking, an activity that hardly mirrors what active kids do outside. "That's a rare kind of exercise where they are walking at a steadygait. There is also running, hiding, seeking, digging, making forts and tree houses," said Louv, whose next book, outlining an antidote to nature-deficit disorder, is due out in May. "One of the forgotten things is the role of independent play. This doesn't follow rules written by a programmers in Silicon Valley. Independent play has to do with their own creativity and mental health." Louv's writings contend kids are less active, in part, because urban environments are not inviting to the kinds of unstructured play that characterized the American childhood prior to 1980. A co-founder of the group Children and Nature Network, he says that making neighborhoods more safe and "green" will do much to promote physical activity among kids, and the benefits go far beyond reduced body-massindexes. "There is value added that has to do with the psychological health of green exercise," said Louv. To be sure, Bailey doesn't argue "exergaming" should replace outdoor play. "It probably won't solve epidemic obesity, but it could be a useful tool for parents and health professionals who are trying to help them be more physically active, especially in those children that enjoy video gaming," he said. Kids in the study declared J-MAT among the least fun of the six games, while they enjoyed the least vigorous games. Girls rated Dance Dance Revolution the most the fun and boys preferred Wii Boxing. Hardly a surprise there, but Bailey was impressed with the enjoyment factor registered by Sportwall, a wall-mouted game in which players throw balls at targets and burn almost as many calories as chasing Jackie Chan. Sportwall, a group game played at school gyms, is geared toward intense activity for intermittent stretches, since rests are built into the play, while J-MAT is like aerobic boot camp. Bailey's study, funded by a grant from the University of Massachusetts' Healey Endowment, is published in Archives of Pedriatics & Adolescent Medicine, a journal of the American Medical Association. A BYU-led study has found that certain video games enable kids to burn as many or more calories than walking. Here's the amount of calories burned per minute for certain activities and video games, some of which are not available to average consumers.